Think Blonde! As clients ask to lighten up for warmer weather, Blondor empowers you to achieve beautiful results across the full spectrum of blond hair. 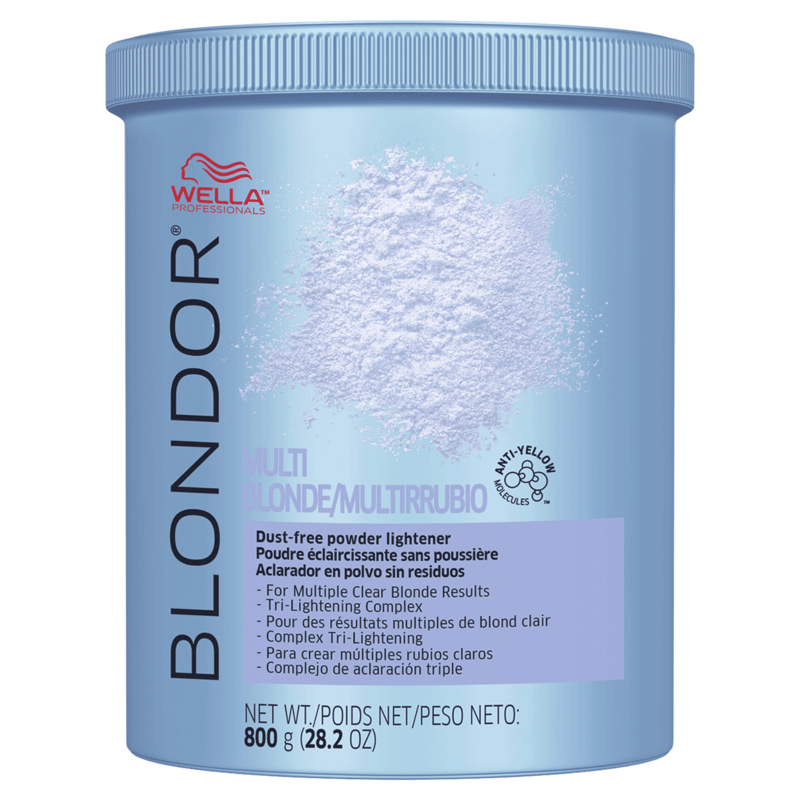 Wella Blondor Multi Blonde Powder Lightener 800G is for both on and off the scalp lightening. It's dust free and completely odorless. Simple and safe mixing with revolutionary easy-to-pour dispensing system, which makes no direct contact with the stylist's skin. Gives perfect results for both on and off-scalp techniques. Variable mixing ratio provides individual choice of consistency. Blondor creates a new dimension in lightening and highlighting techniques. Please refer to manufacturers instructions on mixing ratios. Preparation: Depending on the desired degree of lightening mix with Welloxon Perfect Pastel, 6%, 9%, 12% in a ratio of 1:1 up to 1:2 in a non-metallic Bowl. The lower the peroxide strength, the gentler the lightening process. If there is contact with scalp, do not use a peroxide strength higher than 6%. Application: Apply the bleaching mixture evenly to dry hair. The development time depends on the condition of the hair and the desired result. Carefully check hair every 5-10 minutes during the process. The maximum total development time is 50 minutes. If adverse reaction occurs during treatment (e.g. itching, burning or rash or any unexpected reaction), stop and immediatley rinse with lukewarm water. If necessary, seek medical advice. After development time is complete, rinse out thoroughly with warm water and shampoo. Apply Blondor Blonde Seal & Care after rinsing for increased shine and condition. "blondor is the best bleach hands down"
"Great product. No need to add a toner gives an even tone all over"
"My favorite lightener! I''m ALWAYS using this on my hair and my clients hair! Works like a charm every time!" "Get the full spectrum of blonde with this product. EXCELLENT! Easy to use"
"Get the full spectrum of blonde with this product. EXCELLENT! Easy to use."